Looking for neck designs for kurtis with lace work? Okay! You have landed the right page. Those who love minimalism in their style know what an incredible gift it is to wear a Lace work kurti. The delicate fabric ‘lace’, gives a stylish finish without addition of any prints or work on it. 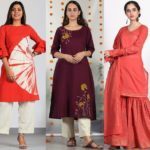 These kurtis are easy going and so effortless to pull off for any occasion. Thus, it suits from college goer to professional women. 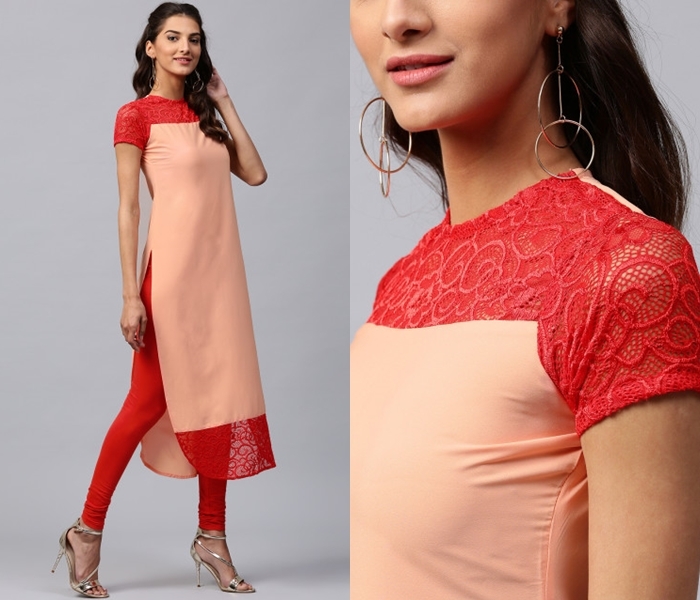 To make this already simple, yet sophisticated, lace kurtis a bit more attractive, you can experiment with a tad more interesting neck designs. 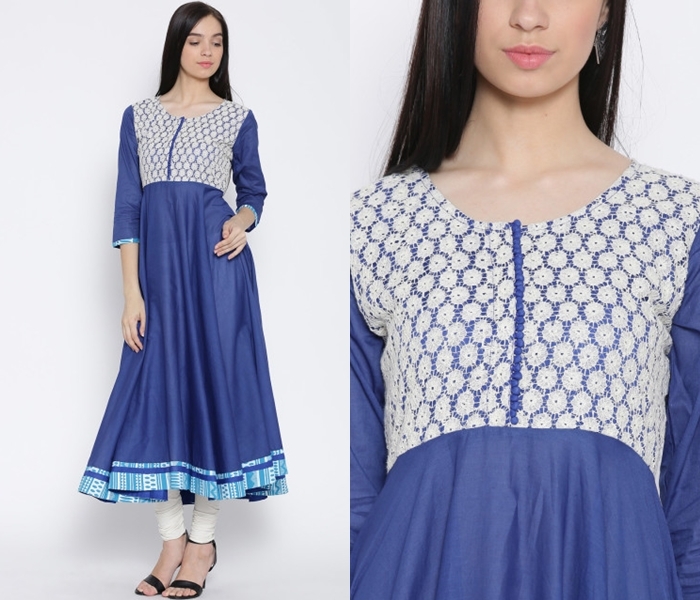 Lace kurtis generally comes with plain work with just the delicate designs on the fabric to do the talking. 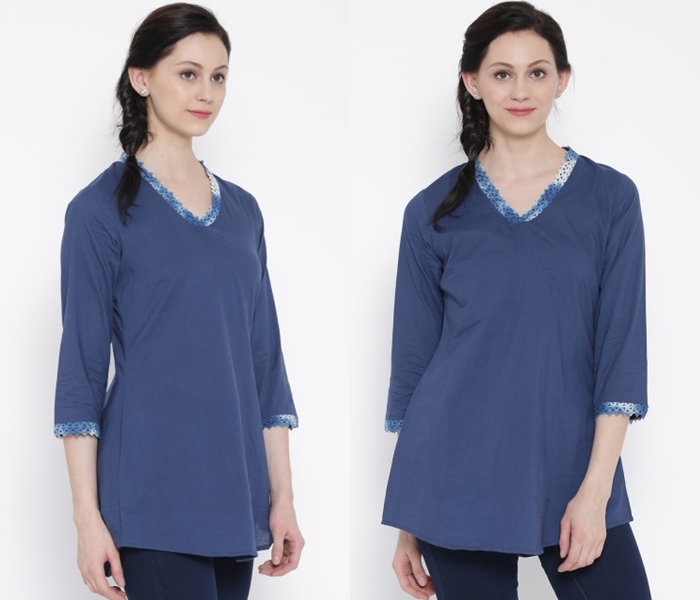 So, if you care to highlight those designs on your kurti neck and sleeve, it will give you a totally different appeal. 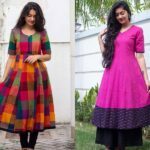 Before you opt for the neck design for lace kurtis, you need to consider two essential things in mind. One, are you going for a complete lace cloth for your kurti?, or, are you going to use lace fabric as embellishment in another cloth? Because, if you want to use lace as adornment, you need to opt for different neck designs. Here below, we have provided neck options for the both the style so you can flaunt this kurtis with grace and ease. 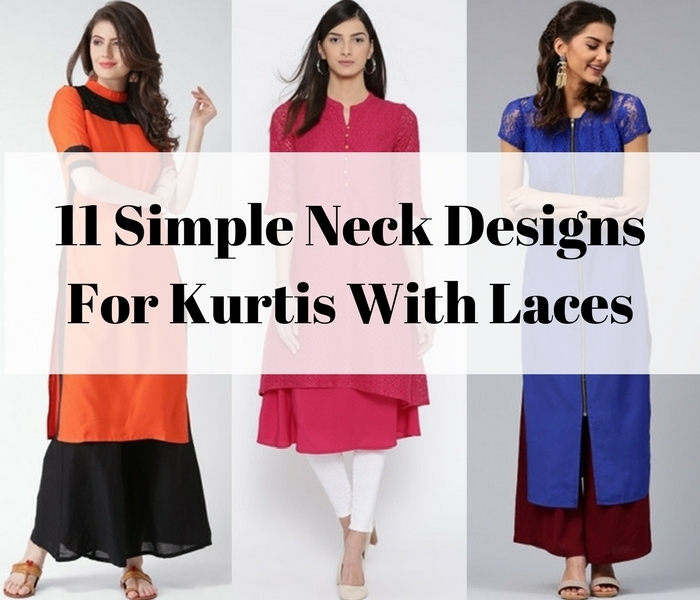 Let’s get going and see below the various neck designs that goes well with lace kurtis. High necks give such a youthful look to anyone who care to try this. However, with lace kurtis, this neck style is even more stylish. If possible, play with two flattering contrast colors for a catchy neck design like the one below. Plain kurti are hot among many who wants to be simplistic in their design. Such kurtis can be stitched with lace borders around the neck for apt highlights. 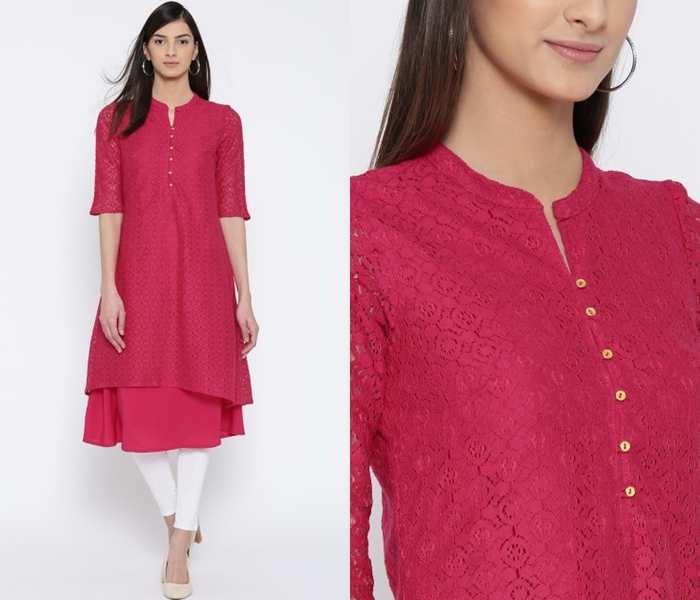 A simple V neck with lace borders of matching color is enough to perk up your plain kurti as below. 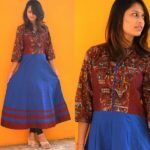 Another interesting way to get your neck design done on kurti is to have simple round neck with lace fabric, and highlight them with contrasting piping work. If you want expensive suit look out of your kurti, you can get the piping done with an zari/gold cloth. Simple chic collars go extraordinary well with any tops. These can be tried with lace kurti as well. If your lace kurti has no other prints or highlights, opt for collar necks with catchy buttons. There are plenty of fancy buttons available in stores, so make sure to get the best one and use it along with collar necks. Another fabric that goes unbelievably well with lace cloth is, Net. If you want a simple designer neck for your kurtis, try to embellish with net fabric around the front neck as below. If you want a more cool looking front neck, try the net cloth in contrasting hues. If you plan to wear a simple color block kurti, then try the lace fabric around the neck and hem line. You don’t need any fanciful neck design here. Even a simple closed neck or high neck with lace cloth is enough to do the magic. Make sure, the colors are quite dramatic for this pattern to work. This is not a familiar neck design among kurtis. Many prefer buttons on the kurti than the zippers. However, if you try this unique design with lace fabric, the results are quite alluring. You can have the lace cloth covering the entire kurti or just the bodice. Another way to style your kurti with lace is to have the back neck completely done with this sheer delicate fabric and leave the front neck as you wish. This is quite a creative neck pattern to try with your kurtis. Boat necks are being fancied by all women in almost all attire. And lace kurtis are no exception. Go fashionista with a flattering boat neck with your lace kurti. With boat necks, you really need nothing else to make your kurti stand out. Sometimes, your kurti might have been made of other fabric and you might want to include lace as embellishment. In such cases, you can order readymade thin zari borders and highlight your bodice as below. It completely depends on your creativity. This work will give a rich finish to your plain kurtis. 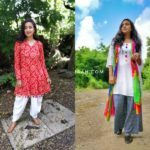 Another way you can adorn your kurtis, especially the anrakali and umbrella style, is to stitch the complete bodice (along with neck) in an intricate lace cloth. This is a great way to elevate your dress without going overboard on heavy designs. Lace is an adorable fabric that can make a huge difference to your kurtis. All you need to know is how to make this simple cloth look astonishing in your tops. By experiemting your neck design, you can make plenty of variations to your kurti style. Do try the options which we have curated above. If you have anything new to add in this list, please let us know by dropping a comment below.